Denton Public Library | Check it out! About 30 years ago while a student, I moved into a duplex at 1204 West Mulberry St. next to HMS Art Supply and across the street from the Art Building on the UNT campus. A fantastic location for many reasons, but especially so because of my neighbors to the east at 1120: Olive and Kathryn Honeycutt. We would exchange pleasantries on occasion and one afternoon they invited me over for tea. Olive was elderly then (I guessed about 90) and her sister a bit younger. In the course of a very genteel visit, I’m sure we talked of many things but, what stuck in my mind was the story from when Olive was working on the Square in the late 1920s-early ’30’s. She said she walked over to the old Courthouse and watched the trial of, and here is where time and memory are a bit foggy, either one of the Barrow Brothers or of Barrow Gang member Raymond Hamilton. I sort of remember thinking how strange and small town it must’ve been to be able to walk in on a trial for what we consider *now* as famous and notorious criminals. A refresher: Clyde and his brother Buck robbed the Motor Mark Garage on West Oak Street two blocks west of the Square on Nov 30th, 1929. Clyde was driving the escape vehicle but crashed it and escaped while Buck was shot by police and arrested. He was tried in Denton and sentenced to Huntsville Prison. Raymond Hamilton was arrested for robbing the First National Bank in Lewisville, Texas on April 25th, 1934 and his trial was also held in Denton. But, this blog post isn’t really about the Barrow Gang. I also have a vague recollection that she mentioned knowing Larry McMurtry when he attended UNT (NTSU) in the late ’50s. Maybe another tale lost to time in my mind? Intriguing idea: did McMurtry live in the same duplex that I did at some point? I *did* find McMurtry in the 1957 city directory living at 1120 West Congress. Thanks again for the tea, Olive and Kathryn. I don’t know about you, but I am still struggling with this years’ time change. It could be because I am getting older but the change did prompt me to start thinking about time. Not just the passing of it, but the marking of it. Have you ever noticed how many clocks we have in Denton? Today they blend in with the scenery but it wasn’t so long ago that we really relied on community clocks. Of course, not all of them have survived the passing of time, but some are ticking on. I’ve often admired the clock mounted to the side of the old Denton County National Bank building on the corner of Hickory and Locust. A few weeks ago the library hosted a program about historic stained glass in Denton. The presenter, Christie Woods, said she had to repair the stained glass on the top of the clock after a hail storm. My first thought was, I didn’t know there was stained glass on the top of that clock and my second thought was, who in the world would put stained glass on the top of a clock in Texas? The elaborate clock was made by the McClintock-Loomis Company of Minneapolis, Minn. The company specialized in these elaborate, decorative clocks and different models can still be found all across the United States. The system is set up so that the clock we see is actually a “dummy clock” controlled by a more sophisticated clock located inside, usually in the lobby, of the building. An ad published in the January 15, 1917 edition of the Denton Record-Chronicle described the newly installed clock. It measures 10 feet long and 4 feet square. The outside enclosure is made of brass, copper, and bronze and “holds four beautiful art glass signs, reproducing the name of the bank, also four 30 inch art glass clock dials and the five chime bells.” The chiming system was very impressive and the ad describes it in detail. At a quarter past the hour it would ring four strokes then it would play the Westminster chime; at half-past the hour it would ring eight times then play Reveille; at the 45 minute mark it would ring twelve strokes and then play the Cathedral peal; and at the hour, it would ring sixteen strokes, play Westminster again, “followed by striking of the full hour.” Seems like a pretty complicated system to me, but then again, I don’t have a pocket watch to set every day. Speaking of the clock in the Courthouse, it was installed when the Courthouse was nearly complete in 1897. (Read more about the building of the Courthouse). It too could prove unreliable. I came across an interesting article from 1947 when the clock went wonky and would chime 13 times at 1 a.m. and 1 p.m. The same article mentions that until March 1945 the clock was motivated by a 300-pound weight on a cable which ran the length of the shaft from the tower to the basement of the building. That is 8 stories! Next time you visit the Courthouse-on-the-Square take a minute to peer up into the rotunda to marvel at that. Looking east on Third St.
You know, it wasn’t so long ago while I was attending school at Stonewall Jackson Elementary that Texas Woman’s University (TWU) added another clock to Denton’s skyline. From the school yard, heck, anywhere in Denton, we watched the 18 story building being built. 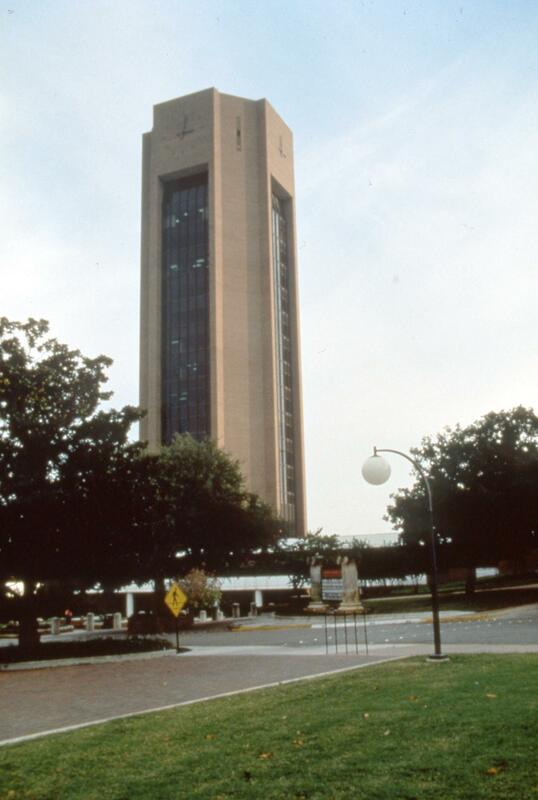 The Administration Conference Tower (ACT) was opened in June 1978 2 and on each of the four sides of the top of the tower was a clock face. I have to say they came in handy when we were running around the neighborhood and needed to see what the time was to get home for dinner. But on the flip side, if I ever said I lost track of time, my mom just reminded me of the 18 story building with the clock on the top. This clock also rang out with the Westminster chimes but instead of bells it had an electronic system with huge speakers tucked into the corners of the building. The chimes rang on the hour from 8 a.m. to 8 p.m. At first the chimes would ring on the hour for 24 hours, but for some reason that tended to disturb the neighbors. 3 That clock was removed in 2014. If you needed to borrow time there were a number of other community clocks around town. Which ones do you remember? Later, we could call (940) 387-0212 to check the time and temperature, but this was before we all had mini-computers in our pockets that, among other things, mark the passing of time. Here’s a link to a video for more information about the McClintock-Loomis Company and their clocks. The quality is not so good, but it is informative. If you go to the 3:30 point in the video, you’ll find out about a “secret message” included on our clock. Denton Record-Chronicle. July 20, 1933, page 1. Bridges, Phyllis. Marking A Trail: The Quest Continues: A Centennial History of Texas Woman’s University. Page 225. The Lasso. Bells Still Chime. April 14, 1988, page 12. The photographs used in this post can be found in the Denton Public Library Collection on the Portal to Texas History. A couple of months back someone from the Denton County Genealogical Society told me that they were part of a writer’s group called GenPen, for people interested in writing about their family history. I’ve been wanting to write a little something about my family for my kid (someday). As a sort of apologetic explanation for any atrocities committed by me while being a parent. So it was the word buicking that got me to thinking about road trips and memories I hadn’t thought about for a long time. When I was a kid and living with my grandparents, I would often hear my grandfather use the phrase, “Peter Beck” in place of a curse word. He enunciated it slowly, with a certain relish. Being an internal joke, the other adults would laugh – but I never questioned it or asked why; it was the acceptable term to be used after one was beaten during a game or did something wrong. Much later I asked my dad what Peter Beck meant and he said that during my grandparents courting years, Peter Beck was the “competition.” Although Mr. Beck lost, my grandfather still held a grudge, and as curse words were forbidden in their home he decided to make one up. Hence, Peter Beck became his expletive of choice. But there was no way he could compete with my grandmother’s relationship with Dean Martin. She would listen to his records on their console stereo after dinner some nights. My dad recalls one evening after my grandmother had been listening to “Dino” that he spied my grandpa outside the kitchen window, peeing on my grandmother’s roses. My dad remembers thinking that it was a weird thing to do. Jealousy knows no bounds, I guess. My grandfather was one of seven kids and grew up dirt poor. When they were young, he and three of his brothers starting singing in a quartet together and they called it the Trice Quartet. The brothers and sister remained close which is why we took lots of day trips. They all lived in other small towns that were within a one to two-hour drive. The roads were long and lonely; I’d mark the distance by a crooked tree in a distant pasture or an old farmhouse on the right, and then maybe a country store where we might stop to get a root beer. My grandfather drove a tan Dodge pick-up and he usually turned on the radio to listen to country music; sometimes he’d sing along. For special trips, he wore a felt hat and a bolo string necktie, while my grandmother always had her long black hair in braids pinned to her head and decorated with some bejeweled comb. We’d visit the various cousins, great-aunts or uncles and on a particular visit, my great-great Uncle Ivan who seemed to be in his 80s and lived with a mannequin of the female kind. In his spare time, Uncle Ivan sang and recorded love songs at home using his 8-track tape player recorder. I remember being very impressed, looking at all those tapes while eyeing the mannequin across the room. She was wearing a nice dress and a hat. He introduced us, but I cannot for the life of me remember her name – only one of the song titles on the spine of the 8-tracks: “Sittin’ on the Porch with Ida.” He played the song for me. I remember his voice was warbly and kind of ragged. The tune was listless and repetitive and did not impress me. The mannequin, however, that was something else. Being seven, my brain factory was workin’ over-time. I tried not to stare, but I remember wondering if that mannequin was looking at me, or if she talked, and did she have any other outfits and if so, how did she get dressed? Somehow, you just sense that some questions shouldn’t be asked so I didn’t. That has haunted me my entire life. Another Sunday – this time it was a drive with my parents – we’d come to an old rickety bridge. The kind that only one car could pass across at a time. Well, my mom was worried about the condition of the bridge. Clifford, she said, stop! Do not cross that bridge-it might break under the weight of the car! She was really scared, so he slowed down and stopped just before. My mom got out and walked across the bridge several times and proceeded to jump up and down. Then she got back into the car, pronouncing that the bridge would be safe to cross. My dad, he stayed quiet. Featured images, A 1970s Buick Regal; http://Tantisakchaicharn, Amusorn. 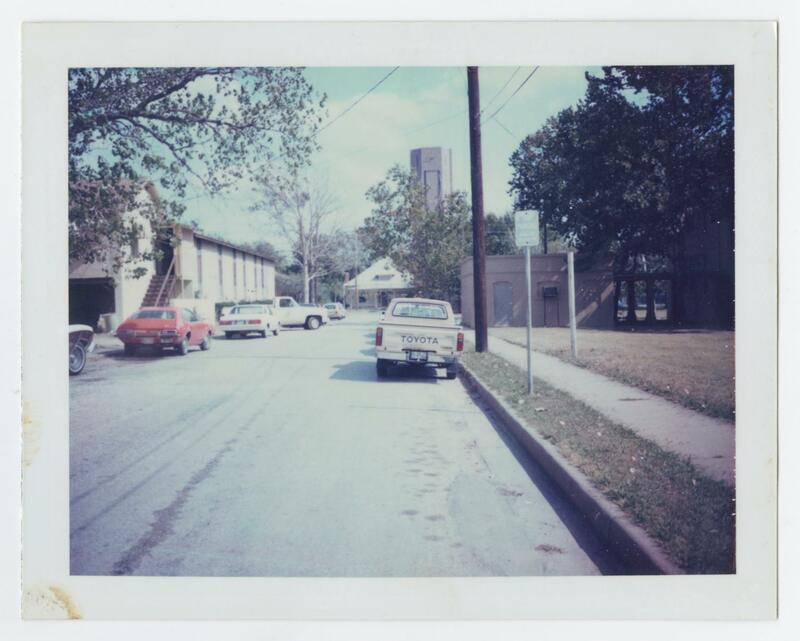 [A 1970s Buick Regal], photograph, [1970..]; (texashistory.unt.edu/ark:/67531/metadc945069/: accessed January 23, 2019), University of North Texas Libraries, The Portal to Texas History, texashistory.unt.edu; crediting UNT Libraries Special Collections. Pick out a book that you think your date would enjoy and encourage them to do the same for you. You could share a book you own, purchase one at a bookstore, or visit any Denton Public Library location together to check the books out. Multistory used-book & CD shop with rooms full of volumes covering a variety of genres & topics. Used book store specializing in romance novels also offering vinyl records, CDs, DVDs & posters. Books, DVDs, CDs, Vinyl Albums, Children’s Literature, and MORE!! Bookseller chain stocking housebrand eReader, plus a broad selection of titles for adults & kids. Located at North Branch Library, this bookstore is run by the Friends of the Denton Public Libraries and sells used books, CDs, DVDs, and more. Most books cost around $.50 – $1.00. 9 a.m. to 8:30 p.m. Note: Credit cards are not accepted at Secondhand Prose, please pay using cash or check. Comics (including graphic novels), games & collectibles shop also hosting author book signings. Video games, toys, action figures, comics, vinyl records, trading cards. Typical comic book shop featuring new releases, role-playing games & in-store events. Psst! Your library has graphic novels too. Use the “audience” filter to narrow down options to graphic novels written for adults, teens, or children. Go on a Reading Date! If your date is really into reading, there’s a chance that they might secretly want to go on a date where they can bring a book. Try taking your books to a favorite park, the lawn of the Courthouse-on-the-Square, any library location, or a local coffee shop. Note: Jupiter House is currently closed for construction (as of 2/12/2019) and Q’s Café opened after the list was created (https://www.facebook.com/qscafedenton/). These literary recipes are so good your date won’t want to stop eating. Check out one of the books below or find recipes found online to cook your bookish date a dinner or dessert inspired by literature. Planning to stay home for the evening? Check out these books and learn how to impress your bookish date with a cocktail inspired by fiction. Do you have other ideas for bookish dates in Denton? Share them in the comments! Serendipity. Thank goodness for it. Just today I learned about a Miss Cathy Muirhead, TWU sophomore and resident of 1502 Greenwood Street, who, in January of 1969, was named “Maid of Cotton” by the National Cotton Council of Memphis, TN. That was exactly 50 years ago, give or take a week. January 8, 1969 TWU Daily Lass-O. The Maid of Cotton beauty pageant was sponsored by the National Cotton Council, Memphis Cotton Carnival, and the Cotton Exchanges of Memphis, New York, and New Orleans from 1939-1993. The contest was held annually in Memphis until the Cotton Council International moved to Dallas, Texas in 1985 where competition was held until its demise in 1993. Miss Muirhead was not the first woman from TWU to have won the contest; Jeannine Holland was crowned Cotton Maid in 1951. If you include Miss America winners Phyllis George and Shirley Cothran (both Denton High alumnae), Denton had a pretty large per capita of beauty contest winners there for a while. The papers of the Maid of Cotton Contest are held in the Smithsonian’s National Museum of American History. We still don’t know what it is or where it comes from, but there’s something there. This is not another flying saucer scare. Whatever it is, it’s something real. Anxiety and concern abound, but there is no outward sign of panic. Real indeed. This was unlike the numerous sightings of the preceding month, Mac Brazel was sure of that. After all, he was standing over the wreckage. Unsure of its origin or purpose, but aware that it may be related to the strange objects seen in the sky across the country, he packed up what he could and delivered it to Sheriff Wilcox in Roswell. Stymied, Sheriff Wilcox in turn contacted officials at Roswell Army Airfield to investigate. This incident would later become the impetus behind the world’s fascination with UFOs. January 2nd is unofficially known as Science Fiction Day, corresponding with famed writer Isaac Asimov’s birthday (the Denton Public Library has several selections of Asimov available to check out here). So, in honor of Science Fiction Day we revisit arguably the most infamous of UFO stories. Whether or not the Roswell Incident is science fiction or fact has been debated for decades. 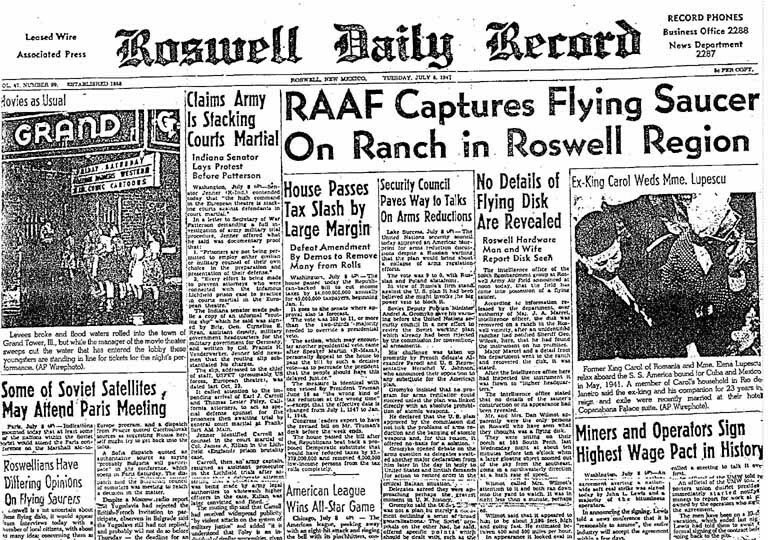 On July 8, 1947 the Roswell Daily Record reported, “RAAF Captures Flying Saucer On Ranch in Roswell Region.” Just hours later, the “Army Debunks Roswell Flying Disk as World Simmers with Excitement.” These two conflicting reports, made within hours of each other, served as the catalyst for conspiracy. We take for granted the scope of the controversy as we know it today, but at the time public interest was more or less sated with the official story of a weather balloon. Regardless, the government did seek to investigate UFO sightings to determine whether or not they were a threat to national security. This investigation began with Project SIGN in 1947 and culminated in Project BLUE BOOK from 1952-1969 (Project BLUE BOOK records are available online from the library with Fold3!) However, it wasn’t until some thirty years later that the controversy surrounding what happened in Roswell became what we know it as today. In the late 1970’s several persons claiming to be present during the Roswell Incident came forward with claims never before made, most notably former intelligence officer Jesse Marcel. Claims of cover-up and the existence of alien remains reignited public curiosity about the incident perhaps enhanced by a spate of theatrical releases with aliens as a central premise, including Star Wars (1977), Close Encounters of the Third Kind (1977) and an episode of Unsolved Mysteries (1989) specifically dealing with Roswell. Eventually, pressure for more information led New Mexico Congressman Steve Schiff to commission a report by the General Accountability Office. The Roswell Report: Fact versus Fiction in the New Mexico Desert was released in 1995 and is available in all its 994-page glory online here. The report confirms the wreckage found in Roswell as that of a high-altitude balloon, but not a weather balloon. It was supposedly a part of Project MOGUL, a secret program that used balloons to detect nuclear explosions in order to determine if and when the Soviet Union developed nuclear weapons. This revelation did not deter skeptics. Only a month later the infamous “Alien Autopsy” video was released by Fox which was later discovered to be staged. There’s even a theory that suggests the Roswell Incident was a collaborative effort between Josef Stalin and Nazi Doctor Joseph Mengele to create genetically altered “grotesque, child-size aviators” with “unusually large heads and abnormally shaped, oversize eyes” to incite panic and hysteria among the American public using HG Wells’ War of the Worlds as inspiration. 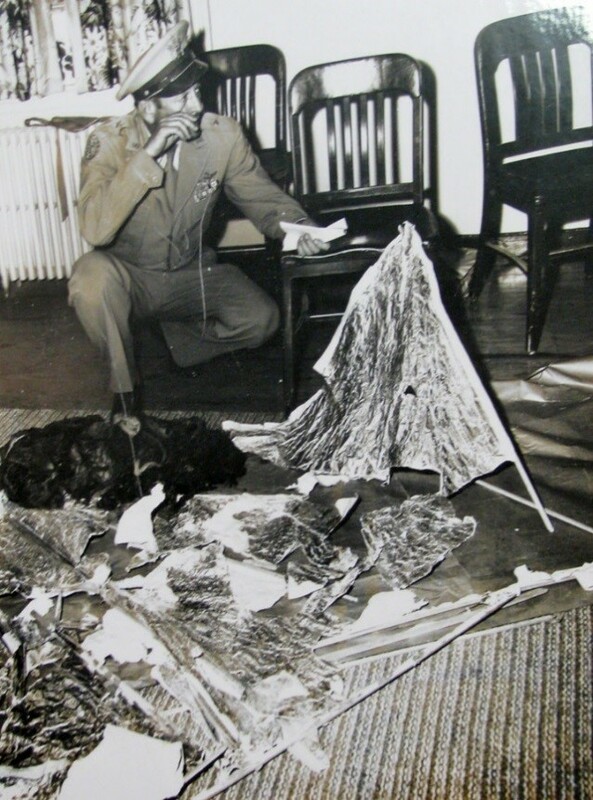 Now, much of the focus by UFOlogists seems to be on what is referred to as the “Ramey Memo.” A now famous photo, the original negative of which is held in the archives of the University of Texas at Arlington’s Library, depicts Lieutenant General Roger Ramey kneeling over the wreckage from Roswell holding a memorandum. One picture of LTG Ramey shows some text of the memo which researchers have vigorously attempted to read using various techniques with varying results. One such attempt was publicly made on a 2017 episode of the Travel Channel’s Expedition Unknown in which a court certified forensic photo analyst examined the original negative. There is still no consensus as to the contents of the memo, but UTA has hi-resolution scans of the memo available online here, and is even offering a $10,000 reward for any person or group that can definitively read it! Does this event have a connection to Denton? Why, yes it does. Roger Ramey grew up in Denton and was an alumnus of North Texas State Teacher’s College, now the University of North Texas before beginning his illustrious military career which can be read about here. Ramey passed on 4 March 1963. He is buried in the Garden of Faith section of the Roselawn Memorial Park here in Denton. Whether you’re a searcher of truth or just a fan of ET, we hope you enjoy your Science Fiction Day. Stop by the library, check out a book, movie or research Project BLUE BOOK in Special Collections! Robert Wise, The Day The Earth Stood Still (20th Century Fox, 1951). Donovan Webster, “In 1947, A High-Altitude Balloon Crash Landed in Roswell. The Aliens Never Left.,” Smithsonian Magazine, July 5, 2017, https://www.smithsonianmag.com/smithsonian-institution/in-1947-high-altitude-balloon-crash-landed-roswell-aliens-never-left-180963917/. “RAAF Captures Flying Saucer On Ranch in Roswell Region,” Roswell Daily Record, July 8, 1947, https://web.archive.org/web/20040811212525/http://muller.lbl.gov/teaching/Physics10/Roswell/RoswellDailyRecord.jpg. “Army Debunks Roswell Flying Disk as World Simmers with Excitement,” Roswell Morning Dispatch, July 9, 1947, https://www.physics.smu.edu/pseudo/UFOs/Army_Debunks_Roswell_Disk.pdf. “The Roswell Report: Fact versus Fiction in the New Mexico Desert” (Headquarters United States Air Force, 1995), https://www.afhra.af.mil/Portals/16/documents/AFD-101201-038.pdf. Mike Cox and Renee Roderick, Texas UFO Tales: From Denison 1878 to Stephenville 2008 (Dallas: Atriad Press, 2009). Annie Jacobsen, Area 51: An Uncensored History of America’s Top Secret Military Base (Columbus: Back Bay Books, 2012). 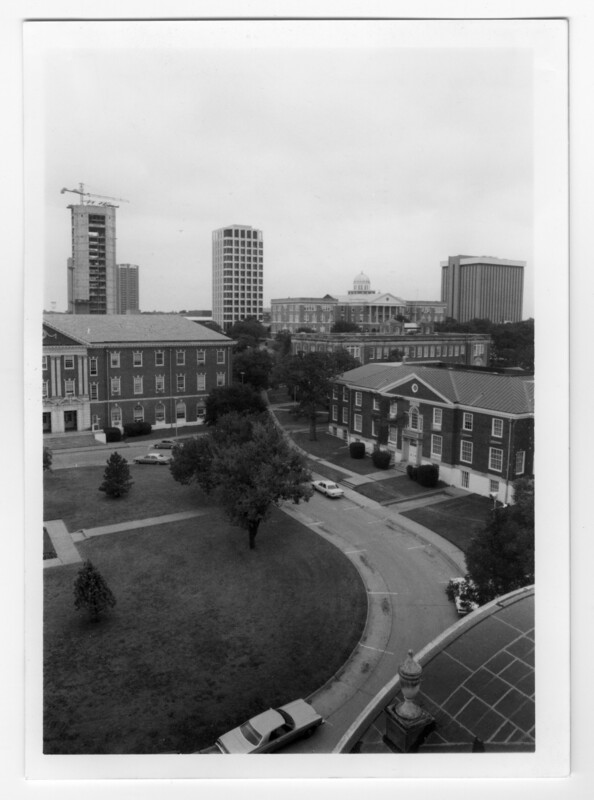 “Ramey Memo High Resolution Microfiche Scans,” Special Collections, University of Texas at Arlington, 2017, https://library.uta.edu/roswell/ramey-memo. PBS did a nation-wide search for America’s best-loved novel and we thought it would be fun to see how Denton compared to the rest of the country. Check out the full results!